The basic objective of Moon Patrol is to get from A to Z. 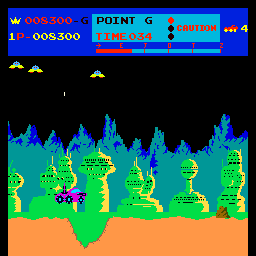 You are in control of a moon buggy, and you must make your way from left to right across the vertically scrolling landscape. Alien UFOs fly overhead and attempt to destroy you by dropping bombs down on you, and you must also avoid/destroy various sized rocks which appear in front of you and jump over craters which are scattered across the surface and also created by enemy bombs. Your buggy has the ability to jump which has to be used to clear the craters, and can also be used to jump enemy bombs as they land. You are also armed with missiles which fire both in front of you and straight up. The vertical missiles destroy enemy UFOs and the horizontal missiles can be used to remove rocks from your path, or to destroy any UFO which strays into your path. 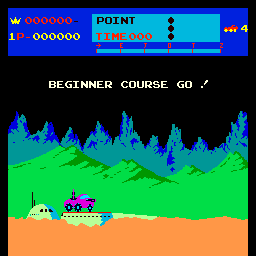 On the expert course (Stage 2 onwards) you will need to contend with a ship/missile which appears behind you. When it flies towards you, you must jump over it and then destroy it. The various parts of each level are split into stages, indicated by the letters of the Alphabet, and five checkpoints are placed at E, J, O, T and Z. 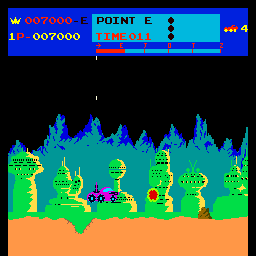 When you reach a checkpoint, you are awarded points for each second remaining under the target time, plus a bonus. Reaching checkpoint Z is the end of the level, where you gain extra bonus points and advance to the next level. 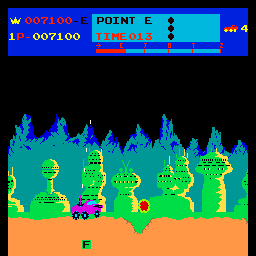 The game keeps track of the best times to reach each checkpoint. 1) A hill to climb while jumping/shooting rolling boulders. 2) various landmines scattered on the lunar surface which you must jump over. 3) Tanks moving towards you on the surface firing rockets which must be jumped or shot. 4) Plants growing in craters which bounce up and down which must be shot or jumped. 5) Alien ships chasing you which must be jumped as they attack and then shot. Later levels have various combinations of these on the same stages making things trickier still. The first level is named the Beginner course and the second stage onwards is the Champion course. After level 2 the course repeats but gets progressively harder, with extra aliens, more landmines, tanks and some trickier jumps to negotiate. Jumping a rock/pit/mine: 50 points. Shooting an alien ship/UFO: 100 points. Shooting an 3-sided alien ship or tank: 200 points. Shooting an alien bomb: 100 points. Shooting a rock: 100 points. Shooting a rolling boulder: 50 points. Reaching a checkpoint in under average time: 1,000 points bonus. Time remaining at checkpoint: 100 points per second under average time. Clearing a complete atttack wave will sometimes yield a 500 points bonus. Reaching checkpoint 'Z': 5,000 points bonus. If you jump when a bomb falls, you will not be killed by the explosion when you land. Keep firing all the time when aliens are above you - this can't be stressed enough. Your rapid firepower is vastly superior to the alien ships and a constant barrage of bullets keeps the odds in your favour. To clear the double rocks in front of you slow down so you can fire at both sections. Try to drive at maximum speed where possible, to ensure you reach the checkpoints as quickly as you can for maximum bonus points. 59 seconds to checkpoint 'E' is the best possible time.